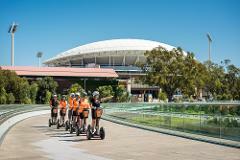 Give someone the perfect gift when you order a Segway Sensation Gift Voucher. A 60 minute tour, valid for 6 months. An adventure of either the fabulous Adelaide Riverbank tour, taking in major attractions including Adelaide Oval, Adelaide Convention Centre, the River Bank bridge, Adelaide Festival Centre and Adelaide Zoo, or experience all the delights of gliding among the grapevines at the iconic Seppeltsfield Winery, travelling through tranquil gardens, stunning vineyard vistas and magnificent heritage listed sites with 19th century Barossa architecture. If the rain becomes uncomfortably heavy at any time, we are able to retreat into the winery and enjoy a coffee (or another beverage) and wait until the rain lightens before resuming our tour, with more puddles! If necessary, we can adapt our schedule so that lunch can be enjoyed during the normal tour time and continue our Segway riding after our meal.